Let’s be clear right from the get-go: this module is the NKJV Study Bible notes only. It does not include the actual text of the NKJV Bible. The NKVJ is available as a Bible module; but that does not include these study notes. The Bible and Study Notes are two different modules. This TW review is only for the Study Notes module. Now, with that out of the way, I’ve got to tell you how nice this module is! It’s all - and more - that you would expect out of a premium Study Bible. It gets a 3+ DDT Book Rating because it is a Great Resource For Everyone! TheWord’s NKJV Study Bible Notes published by Thomas Nelson (2nd Edition) is another of Costas’ excellent hybrid (Book+Commentary) modules. So the “notes” section functions just like a commentary. In fact, there are more than 15,000 notes on the text of the Bible. Check out screen shot 1 to see how the NKJVsbn functions like a commentary. Now, you should understand that this is a hybrid module. 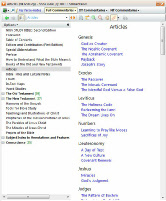 The hybrid combines the elements of a commentary (linked to books, chapters, and verses of the Bible) and general books (following a typical book format). The NKJVsbn is a great example of a module that needs both elements. The commentary notes work well. (Check out screenshot #1.) Click on Rom 3:22 in the Bible window, and the hybrid module takes you right to the comments on Rom 3:22. 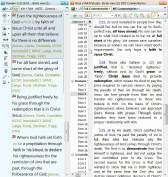 So, if you like to have a Bible view open next to a commentary window, then you will love how TW4 implements this hybrid module format for the NKJVsbn. The functionality of the hybrid module is still under development (as of 9/12/2013). So there are two minor drawbacks currently to the hybrid module. First, the hybrid commentary comments are not yet available as commentary verse links (although a beta now exists where they are functioning!). 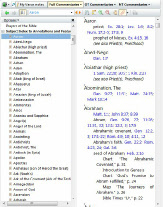 Secondly, it cannot yet function “inline” with the Bible window. Both of these features are currently under development. Costas has said that they are “next” on his list for public release upgrades. While there is no date set for the release, it still is a great module, and very usable indeed! During testing, I found a curious “hitch” in the commentary aspect of this hybrid module: it would occasionally jump to the wrong verse. I found it very curious indeed; and it seemed to be consistent with the verses that were tested. I figured there was a “bug” in the module. So I wrote Costas to let him know - and even included a couple of screen shots. He wrote back, stating that he could not replicate the problem on his system. So I sent him my config.ini file - which allowed him to load his TW program identical to mine. Even with my config.ini file, he could not replicate the problem. We both just scratched our heads at that! Even with this minor inconsistency, the module is still a nice addition to my library. And I’m quite sure it will be a nice addition to yours. And I would think that this issue is specific to something on my computer, and not yours. NOTE: The problem is absent using the latest beta issue of TW. That means it should disappear with the next public release. You can purchase the “New King James Version Study Bible Notes” by Thomas Nelson formatted for TheWord for only $25.95. It’s very well done. As a reminder, the actual text of the New King James Version is available, too, as a separate Bible module. 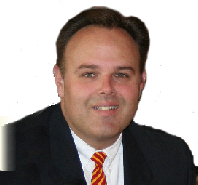 This TW summary review is by Dr. David S. Thomason. Copyright 2013. All rights reserved.